Good afternoon everyone, I hope your week is off to a great (sleepy) start. I was at the Seattle FTU travel conference over the weekend and enjoyed listening to the great presentations and talking to many new and returning attendees. 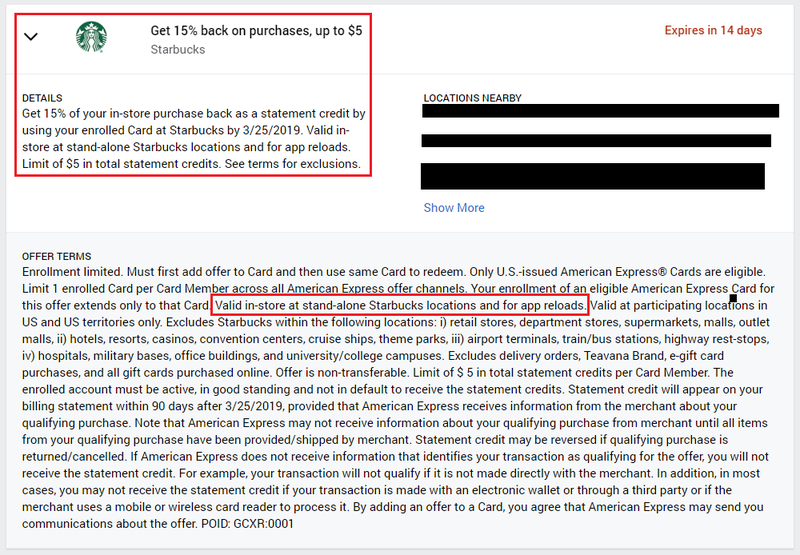 In other news, there is a Starbucks AMEX Offer that came out a few weeks ago that I recently linked to my American Express Blue Business Plus Credit Card. With the AMEX Offer, you can get 15% cash back on Starbucks, up to $5 cash back. $5 may not seem like much, but that is basically a free drink and 15% discount on Starbucks is a pretty good discount. You can sometimes buy more discounted Starbucks eGCs online, but those are prone to fraud and I didn’t want to risk my Starbucks account to save a few bucks. With the AMEX Offer, it clearly states that “app reloads” will work for the AMEX Offer, so that is exactly what I did. This entry was posted in Credit Cards, Promotions + Deals and tagged American Express, AMEX, Cash Back, credit cards, Free Stuff, Promotions, Starbucks.